Our friendship flowered in a place, Arroyo Hondo Ranch, meaning Deep Creek , a beautiful canyon on the Gaviota Coast, of sandstone walls carved by the water that runs out to sea. In January 2002 my husband John and I were hired on as the first managers of Arroyo Hondo Preserve, which had been newly acquired by The Land Trust for Santa Barbara County. We were lucky to already feel at home there, having taken care of the ranch and animals for short spells when JJ and Barbara Hollister went away on trips. The Hollister and Chamberlain families owned the ranch from 1908 to 2001. The spirits of Arroyo Hondo speak. Its old adobe walls tell stories. I was always entranced by a black and white photograph of Vicente Ortega in the saddle, in the meadow, waving his vaquero hat over his head, which was crowned with short white hair. It’s the same photograph that Carmie kept by her bedside. One day I went by myself to the ranch to deliver a gift. No one was home. I was thinking and walking in circles around the orchard, feeling divine intervention had made this place part of me. Now I know: It’s more than just the place, it’s the people that belong to it. I‘ll never forget the moment I met Carmie. The Preserve had just opened for the public to enjoy its delights. I was in the adobe studying the history I’d become smitten with to create a visitors center, when John came running over from the barn, exclaiming: Chris! Vicente’s daughter is outside, Carmelita! She was sitting on the bench in front of the barn and told me she used to sit there with her father and look at the ocean! That had the ring of truth, because there was an ocean view until the modern freeway was built. (In my tenure of three whole weeks, I had become a little doubtful of the many people who seemed to appear out of nowhere claiming Arroyo Hondo in some way.) Through the screen door came a very little woman. She had a familiar crown of short white hair. She was wearing dark glasses, slim black pants, a red sweater, a black leather jacket, and red leather pointed boots. Then she took off her glasses. When Carmelita smiles it’s as if the whole world is sunshine. Even though I‘d never met Vicente, I knew his face so well that I saw him in her eyes, and there was no doubt. She was so energetic and happy; she’d run up to the meadow in those red boots. I immediately fell in love with her and our friendship was forged. Carmelita is the last of her generation in her branch of the Ortega family dynasty. She is the fourth great-granddaughter of Jose Francisco Ortega, el gran capitán. Jose Francisco was the scout for Portola in 1769 for King Carlos of Spain in their overland exploration of Alta California. He was such a good scout, Ortega became the first comandante of the Presidio. Carmie’s blood, and that of her heirs, links to Santa Barbara’s royalty and to our Spanish, Mexican, Chumash, and Americano heritage. In 1794, Jose Francisco was granted grazing rights by the Spanish governor of California to 26,500 acres of prime land running from Refugio to Cojo to raise cattle and thus money for the Spanish monarchy. The vast rancho was named Nuestra Señora del Refugio, our lady of refuge. It was the first ranch in Santa Barbara County and the only Spanish land concession. With his three sons, Don Jose built the ranch headquarters at Refugio, and there the ranch prospered, with grain, grapes, and smuggling. The Spanish crown only allowed trade with Spanish ships. In the remote Refugio cove, when those Spanish supply ships didn’t arrive, trade with British and Yankee ships meant survival. The Ortegas’ Refugio Rancho became rich from these traded goods and famous, so famous that it was ultimately plundered and burned, its riches stolen by Argentine Admiral Bouchard and his men in 1818. Meanwhile the sons and grandsons of Jose Francisco were settling and building adobes in Tajiguas, Arroyo Quemada, Arroyo Hondo, and Santa Anita canyons. Mexico won her independence from Spain in 1821, and finally in 1834 the Ortega heirs were granted a formal Mexican Land Grant from Cojo to Refugio. By the 1840s about 50 members of the Ortega family were living and working in the various canyons, so a schoolhouse was built in Arroyo Hondo. The first recorded birth in Arroyo Hondo was Rafaela Ortega in 1809. 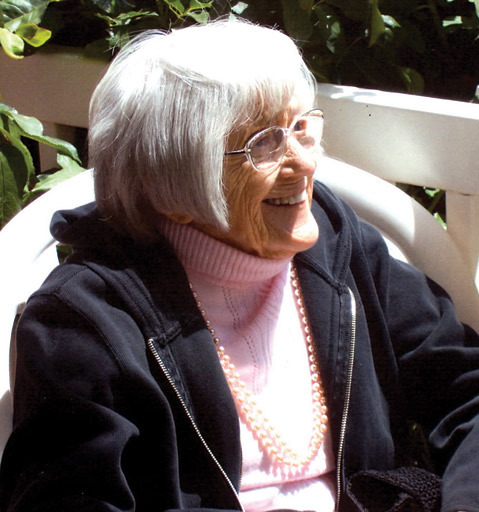 She was born in one of the adobes up canyon, where now there is no trace. She married Daniel Hill and they settled at Tajiguas. Their daughter Rosa married Nicholas Den of Rancho Dos Pueblos. The Dos Pueblos Ranch lands at one point extended from Goleta to the Santa Barbara Mission, up and over the Santa Ynez Mountains to what is now Rancho San Fernando Rey. So, we now come to Pedro Ortega, great-grandson of Jose Francisco. 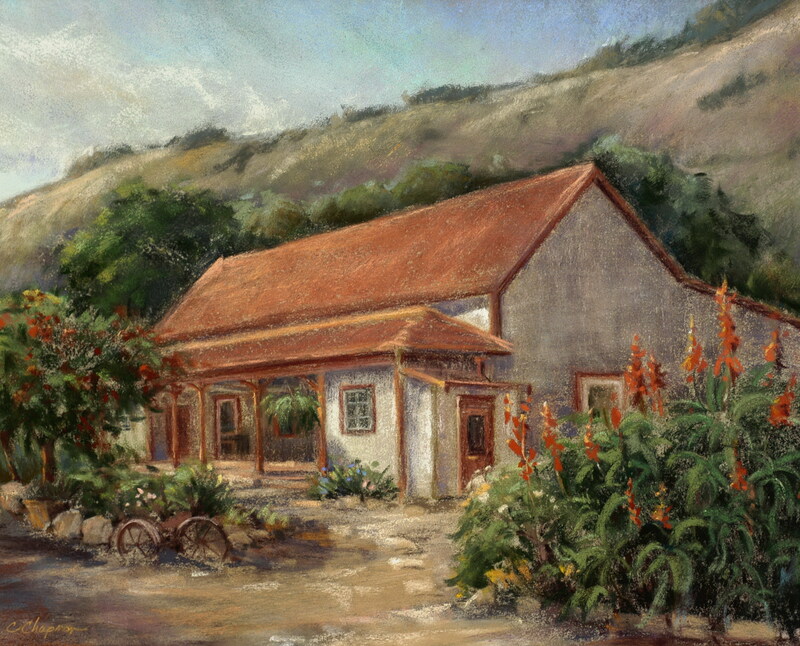 Pedro and his brother Jose built the Arroyo Hondo adobe in 1842, with the help of two important Chumash men, Silverio Konoyo and Fernando Librado. Pedro’s first wife had four children. She died in childbirth and her sister, Pedro’s second wife, bore four more. All eight were born and raised in the Arroyo Hondo adobe. When Pedro died, his son Vicente Francisco Ortega raised a family at the adobe. Vicente Francisco was Carmelita’s grandfather; his son Vicente Fernando was Carmelita’s father. Born at Arroyo Hondo in a little shack down by the beach, Vicente Fernando was a vaquero, a highly respected horse trainer, a railroad builder, a hauler, an oil rig builder, and a farmer. He worked cattle all over the Gaviota, up in Nojoqui and in Las Cruces. Carmelita’s grandmother Catarina (Vicente Fernando’s mother, who was part French) was born in the adobe and raised at the Chumash reservation, where Vicente Fernando also lived for a while to go to school. Carmelita’s mother, Margarita, Vicente Fernando’s first wife was also born in the adobe. Carmie told me the birthing room was my office. No wonder I felt spirits! Carmelita was raised with her brothers George, Alberto, Julius, and sister Victoria in the Las Cruces adobe near the Highway 1 junction in Gaviota. Across the road was a bar and Carmie remembered her dad buying her sarsaparillas there. She told me she loved to sneak up on him when he was taking a nap in his rocking chair outside and pull the bandana off his face. After her mother died in childbirth, Vicente moved back to Arroyo Hondo, and Carmie’s childhood became difficult. But she loved her dad deeply and loved the times they shared on the ranch over many years. She was very proud when her dad was el presidenteof Old Spanish Days. Looking at Carmie, she had to have had his spirit. Carmelita, such a happy and special light in my life, invited me into her life and I embraced it fully. She called me family. We poured over old photographs together so I could reproduce some for the adobe. We began to have so much fun together that our friendship outgrew even Arroyo Hondo. We had many good talks and long lunches. She was absolutely natural and unpretentious, so when I was with her I didn’t really feel I was talking to an elder-and-better; I was just talking with my dear friend. Carmie is an inspiration to me, so easygoing yet sharp and on track. I will always hold her sunshine smile and dark loving eyes in my heart, her great attitude and mischievous sense of humor. I think that she is home now with her husband, Reggie. The last week of her life, our last two times together, we exchanged a powerful closing gift. We both said I love you, and we both said you’re my best friend. Carmelita is survived by daughters Roseann and Dorothy; grandchildren David, Michael, Erika, and Ashley; and great-grandchildren Jessica, Kendyl, Sara, Camila, and Anabel.